BETHPAGE, N.Y. (WABC) -- The Long Island Rail Road suspended service in both directions Thursday on its Ronkonkoma branch after a train struck a car at a Bethpage crossing. Authorities say a 62-year-old woman became disoriented or lost in some way, driving her SUV onto the tracks. As soon as she recognized the danger and that she was unable to move the vehicle, she fled from the car on foot. 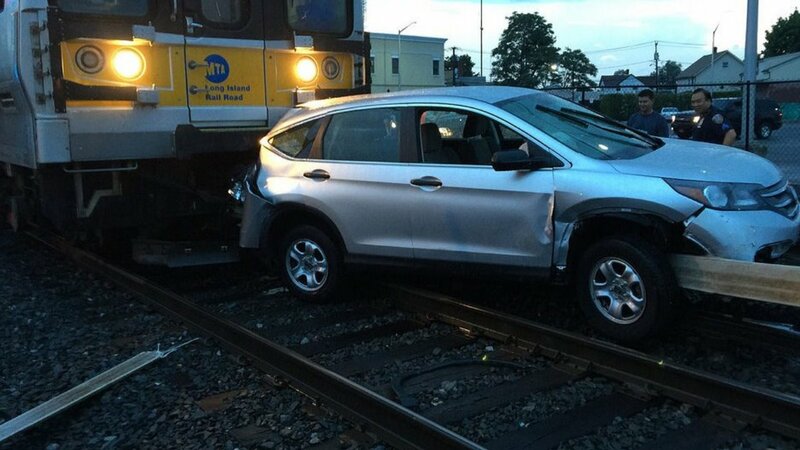 The LIRR train struck the rear part of her vehicle, which did not sustain serious damage and was later removed. The train was due into Penn Station at 6:38 a.m.
Workers had to turn off power to the third rail to remove the SUV and repair the railroad gates, which were stuck following the crash. Service was restore just before 9 a.m., but it caused massive delays for morning commuters.